VANCOUVER — Rob Skish is looking forward to the 2010 Winter Olympics. A “binner” who plumbs garbage containers to fill his shopping cart with food for his stomach and cans for the recycler, Skish figures that when the Olympic crowds come to town, the pickings in the bins will be good. Skish’s prediction is the stuff of bad dreams for Vancouver Mayor Sam Sullivan. When the Winter Olympics open in Vancouver, visitors will find one of the most alluring cities in North America, a green and vibrant port to Asia brimming with diversity, skyscrapers and West Coast cool. But if they take a wrong turn, they will enter Downtown Eastside, a 16-block area teeming with drug dealers, addicts, prostitutes and panhandlers. To win the Games, Vancouver and the provincial and federal governments made some of the boldest promises of any Olympic bid. They promised to add 800 new housing units a year for four years. They promised to cut homelessness and to ensure that people living on welfare and disability checks aren’t ousted from their hotels for higher-paying guests. The city had already seen that happen once. Thousands of low-income residents were dislocated for the 1986 world’s fair, Expo 86. Olaf Solheim, an 88-year-old former logger with a long white beard, starved to death, disoriented and confused, after being evicted from his home of more than 40 years at the Patricia Hotel in Downtown Eastside. A welfare housing block is now named after him. Such promises helped swing a 2003 referendum that threatened to scuttle Vancouver’s Olympic bid. 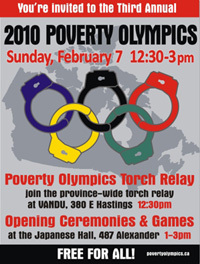 Opponents of the Games argued that the money should be spent on social programs, not a two-week party. Before the vote, the city, provincial and federal governments appeased skeptics by agreeing to ambitious housing and social goals to leave the city a better place. The pledges also helped sway the International Olympic Committee, smarting from examples such as Atlanta, where vagrants were bused out of town, and Beijing, where thousands of people reportedly have been dislocated by Olympic construction. But now critics are saying that Vancouver’s promises are turning up empty. The three governments involved conceded last month that insufficient funds have been budgeted for the social programs. It is “questionable” whether all of the promised housing will be built, a report from the governments acknowledged.